My girl Lindsey makes a mean sangria. In fact, as I am reflecting back on all of the ruby colored, citrus infused concoctions I’ve sampled over the years, Lindsey’s stands out as the very best. I am not the only one singing her praises. This summer Lindsey’s white sangria won the third slot for Best Sangria in Brooklyn at Huckleberry Bar‘s 1st Annual Sangria Competition. She’s legit. 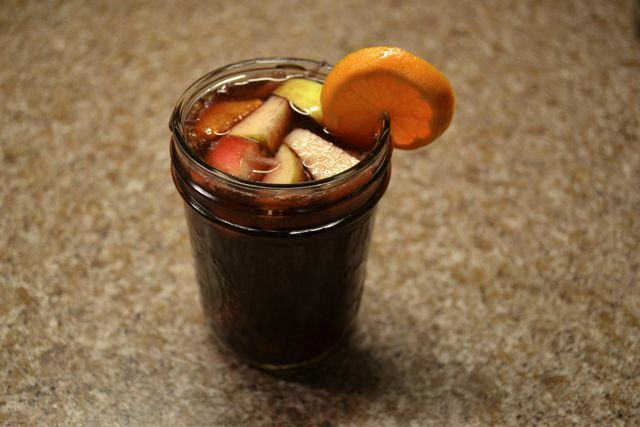 So when she told me she was developing a Apple Spiced Sangria for an art opening at our office this fall, I had no doubt it would be an instant classic. She did not disappoint. 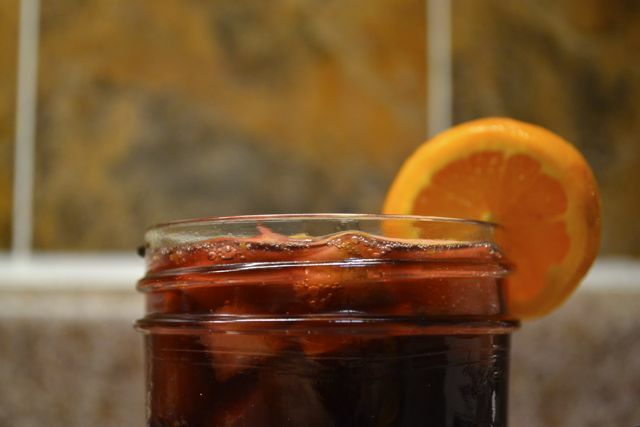 The result was the perfect hybrid between a wintery mulled wine with notes of cinnamon and clove and her signature red sangria. It’s bound to get you in a festive mood but light enough so you can sip throughout the night at your next holiday office party and not get sloppy. Enjoy! The original recipe Lindsey made 24 quarts, or 120 servings. There are very very events in my life I can ever fathom serving that many people, so I cut this down to serve 12 people, twice. Make syrup by combining ingredients in medium pot, bringing to simmer until reduced by 1/3 (takes about 15 minutes). Allow syrup to cool and then strain. 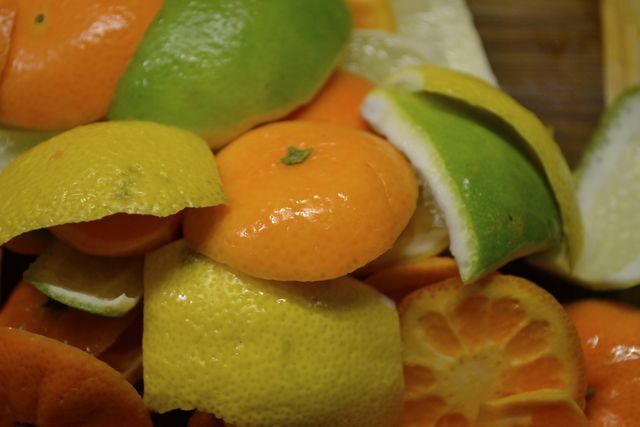 In a marinating vessel, combine liquor, wine, lemon juice and OJ. Add 3/4 cups syrup, mix well. Slice all fruit, add to mixture. Allow to marinate overnight. Before serving, test batch – it should be strong, but not at all bitter. If it is either too bitter or too tart, add the sugar. Add the club soda, being careful not to agitate as you fold it into the mixture. Serve! YES!!! Thank you, this will be made.